Pricing is a very important component of websites, which immediately attracts potential customers. Through this process the component quickly and simply structured price list. Giving visitors to the site with specific information about the price of the service / product. Transparent pricing can ensure that the potential customer leaves, while Inquire service / product. You alone can set its own prices as needed. It has only one template. All items in the price list can be easily edited and updated. The # symbol (right Alt + X) separates each tab. Symbol ## separates items price list Inserts a horizontal line between them. 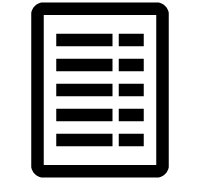 Symbol == separates individual records, on page did not clear.